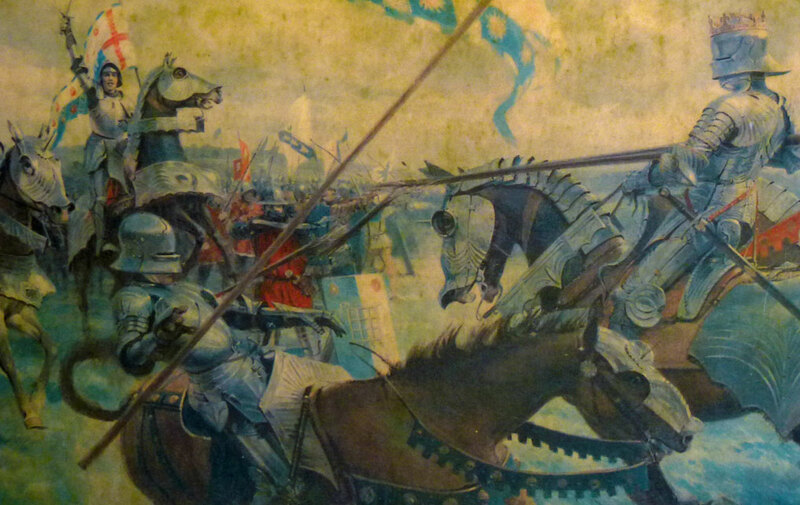 The Battle of Bosworth is one of those events that changed the course of history. Fought on the 22 August 1485, Bosworth was the last significant armed encounter of the so-called Wars of the Roses, the medieval dynastic struggle between the houses of York and Lancaster and their allies, which had rumbled on for three decades or so. 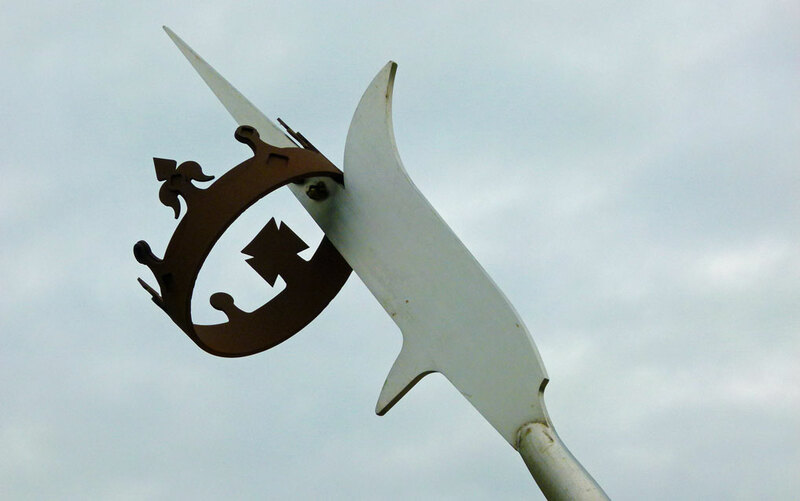 The Lancastrians won the day at Bosworth, King Richard III was slain and the rebel Henry Tudor ascended to the throne of England as King Henry VII. 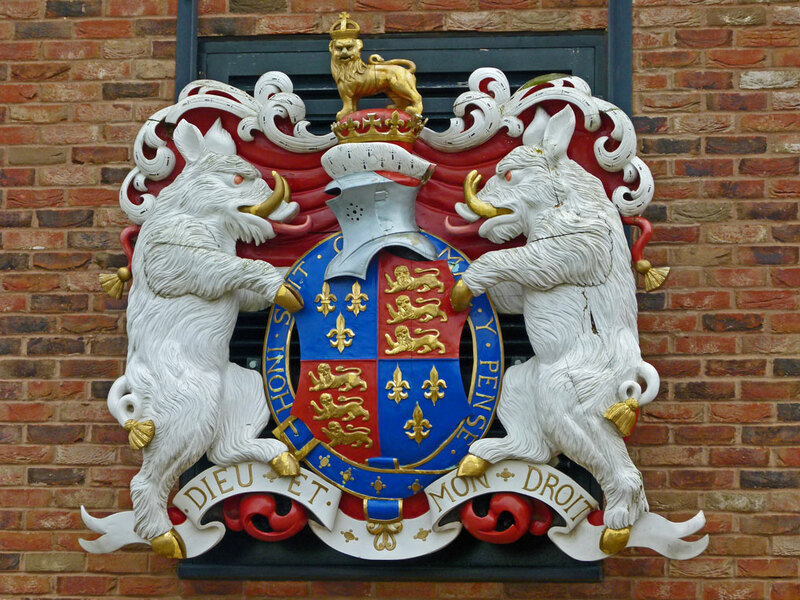 So much happened under the Tudors – world exploration, the Reformation, the beginnings of the British Empire – who’s to say where Britain would have ended up if this remarkable family had not been around? There would probably have been no Church of England; or we might all be Spanish. So Bosworth is one of those places where history was made and it’s worth trying to remember that if you ever visit the place. Richard III’s reputation as a twisted villain is largely based on Tudor propaganda and the play, written by Shakespeare, during the reign of Henry VII’s granddaughter, Elizabeth. As Duke of Gloucester, Richard served his oldest brother, King Edward IV, loyally. His marriage to Anne Neville, daughter of Earl Warwick, ‘the Kingmaker’, gave him fabulous wealth and effective control of northern England which, by all accounts, he governed skilfully and well. When Edward died unexpectedly in 1483, his oldest son, Edward V, was still a minor and Uncle Richard became Lord Protector. The widowed Queen, Elizabeth, and her Woodville relatives, quickly decided to bring the young King from Ludlow to London with a view to having him crowned as soon as possible. Richard may have felt threatened by this, or by the prospect of a Woodville seizure of power. In any event, Richard intercepted Edward and his entourage, arrested Earl Rivers (the Queen’s brother) and Sir Richard Grey (the Queen’s son by her first marriage) and escorted his probably bewildered nephew to the state apartments in the Tower of London. It is said that Richard began to suspect treachery all about him. Lord Hastings, who had been Edward IV’s chief counsellor, was arrested and summarily beheaded. The Queen, in sanctuary in Westminster Abbey, was persuaded to hand over her youngest son, the 9 year old Duke of York, who joined his older brother in the Tower. It was put about that the marriage of Edward IV and Elizabeth Woodville was bigamous, the young princes were declared illegitimate and the Duke of Gloucester was invited to become Richard III. Earl Rivers and Sir Richard Grey were executed in Pontefract Castle. A rising led by the Duke of Buckingham was easily put down (inevitably, the Duke was executed) and all should have been secure in Richard’s world. But support was already gathering around Henry Tudor, a Lancastrian descended from Edward III and Henry V’s widow, Catherine of Valois. Henry, in exile in Brittany, attempted a landing to coincide with Buckingham’s rebellion, but withdrew when he heard of the Duke’s failure. Richard’s position gradually deteriorated in an atmosphere of mounting mistrust all round. The young ‘Princes in the Tower’ had disappeared – almost certainly murdered; but on whose orders? Richard and Anne’s son (another Edward) died at Middleham Castle in 1484 – his parents were devastated – leaving Richard without a legitimate heir. Anne died in 1485; some said Richard had poisoned her in order to marry Elizabeth of York, his niece. Meanwhile Henry Tudor’s allies, and his mother, Margaret Beaufort, were busy making friends and promises. Margaret was married to her fourth husband, the immensely powerful Thomas Stanley; remember the Stanleys – they are important. Henry landed at Milford Haven on 7 August 1485. He had a small force of exiles and foreign troops – certainly not enough to defeat the King’s Army – and hoped to gather more as he marched through Wales and England. Richard, aware that trouble was brewing, had based himself at Nottingham and summoned his followers as soon as he heard of the landing. He also took the precaution of holding Thomas Stanley’s son, Lord Strange, hostage. By the time the two armies met that August morning five centuries or so ago, Richard’s forces perhaps numbered 15,000 men, of which around 6,000 were under the command of the Stanleys. Henry’s army was considerably smaller – perhaps just 5,000. 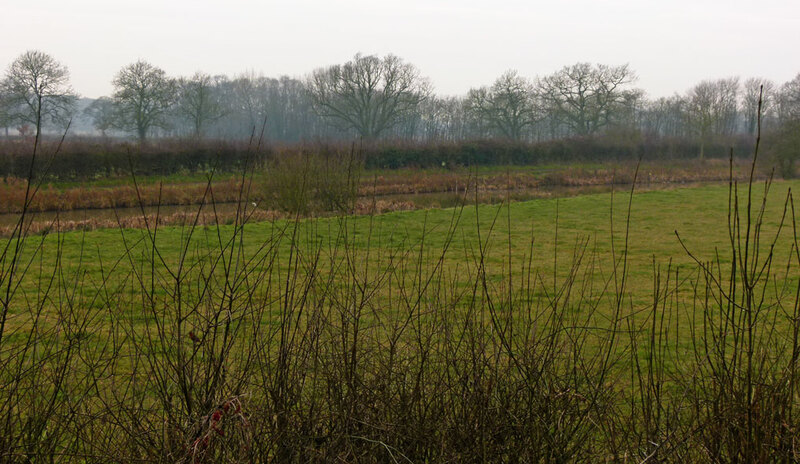 The site of the battle in Leicestershire was largely marshland, in the vicinity of Ambion Hill, possibly at a place known as Redemore, between the villages of Sutton Cheney and Stoke Golding. The precise location of the fighting has been a matter of debate, but archaeologists and historians believe they’ve got it pretty much pinned down now. It was a short battle – one account says it was all over in about two hours. Proceedings probably began with a limited artillery bombardment and an exchange of arrows, but it seems that Richard’s forces under the Duke of Norfolk quickly closed on those commanded by the Earl of Oxford on behalf of Henry. Fierce hand to hand fighting ensued, with Norfolk’s men gradually being pushed back. One of Richard’s captains urged him to flee, but he is said to have replied, “This day I will die as a king or win”. No one, even his enemies, ever doubted Richard’s courage. The story goes that he led a charge toward Henry and his entourage, cutting down Henry’s formidable standard-bearer and hacking his way toward his rival. At that moment, the Stanleys, situated apart from Richard’s army, decided to intervene on the side of the pretender, deciding the course of the battle. Richard was dragged from his horse and went down under a torrent of cutting blows. We can now say with some confidence that, in addition to other wounds, the back of Richard’s head was slashed away and, if that did not kill him, a sword thrust from the base of the skull into his brain certainly did. According to legend, Richard’s battlefield crown (a gold circlet) was discovered hanging on a thorn bush after the battle and placed on Henry’s head by Lord Stanley. Richard, the last English king to die in battle, probably did not expect to lose. The Stanleys’ treachery was decisive and it also seems that part of Richard’s army, the 7,000 troops of Henry Percy, the Earl of Northumberland, were not even engaged. More treachery? Or perhaps they could not cross the marshy ground. Richard’s naked body was taken to Leicester where it was put on display and probably abused – the price of failure in those days. Richard was only 32 and was buried in the church of the Greyfriars, though for many years, a rumour persisted that his body had been unceremoniously dumped in the river Soar. 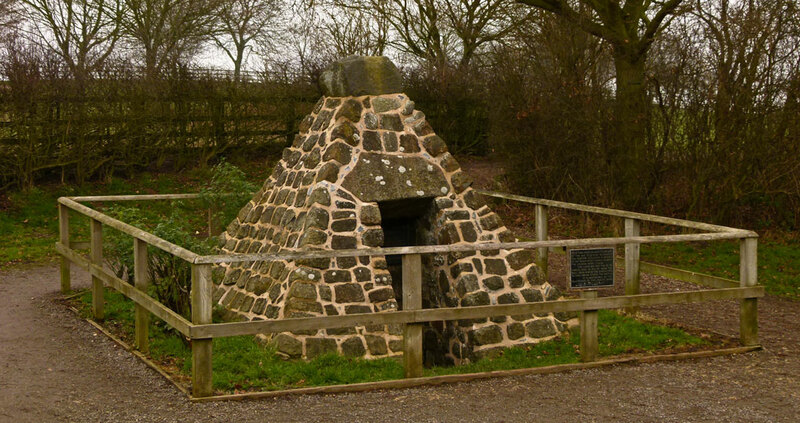 A cairn was erected at Bosworth Field in the 19th century, over a well he is said to have drunk from before the battle. Then in February 2013, it was confirmed that a skeleton found under a nondescript council car park in Leicester, on the site of the Church of Greyfriars, was that of King Richard. It was an amazing bit of detective work, both to find the skeleton and then prove its identity. And it re-ignited debates over whether Richard III was a ‘good’ or ‘bad’ king – concepts which need to be judged in the context of medieval Britain. He was brave and probably never said, “A horse, a horse, my kingdom for a horse”. He was also a product of his ruthless age and I still reckon he murdered his nephews. Anyway, back to the Battle of Bosworth, where by all accounts casualties were surprisingly few – probably no more than 1200 deaths overall. There’s a Bosworth Visitor Centre now, situated on Ambion Hill where Richard’s army hunkered down before the battle. This provides easy parking (pay and display), a café (in an old tithe barn), exhibition/museum and gift shop. 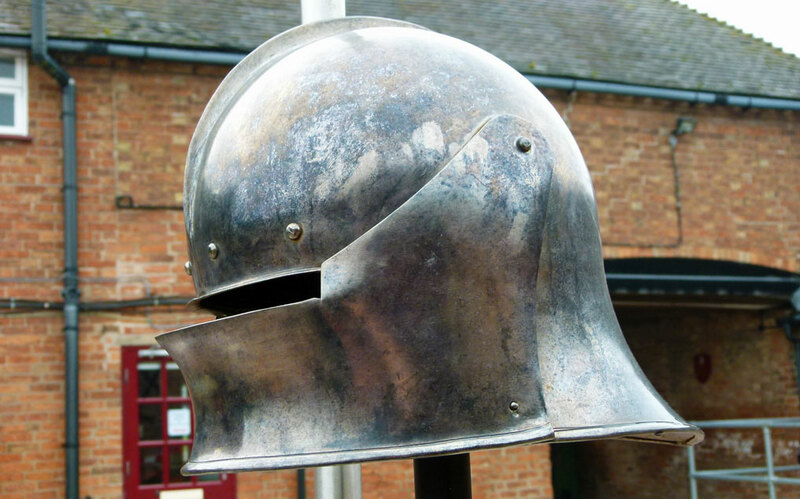 Somewhat worryingly, they advertise a Bosworth battlefield experience – so you might want to give that a miss; but special events are held there, including an annual re-enactment around the anniversary of the battle. Neither the exhibition nor gift shop was open when I called, though the café served a passable coffee. A trail leads around the battlefield and there are excellent markers that highlight points of interest. Some provide an audio commentary along the lines of, “Oim poor Fred from Norfolk and was told to take me bow and foight fer the King” – you know the sort of thing. Despite that, it’s an agreeable, effortless, stroll along a well-maintained footpath amidst pleasant fields, trees – and a surprising amount of birdlife. I tried to picture the scene as it was more than 500 years’ ago. However, my fertile imagination was challenged by distant howls from some sort of race track and a helicopter flying overhead. The task was made even harder because I wasn’t exactly sure where the action took place. But, somewhere round here, I thought, gazing vaguely through Ambion Wood, there was the thunder of cannon, the whinnying of horses, jangle of harnesses, clash of weapons, the roars and the screams of men; and the destiny of the world took another course. I’m glad I went. Find other battlefield sites on A Bit About Britain’s attraction directory. Fascinating account of one of the most enthralling periods of our history, where indeed would we be now I wonder had we not had the Tudors. 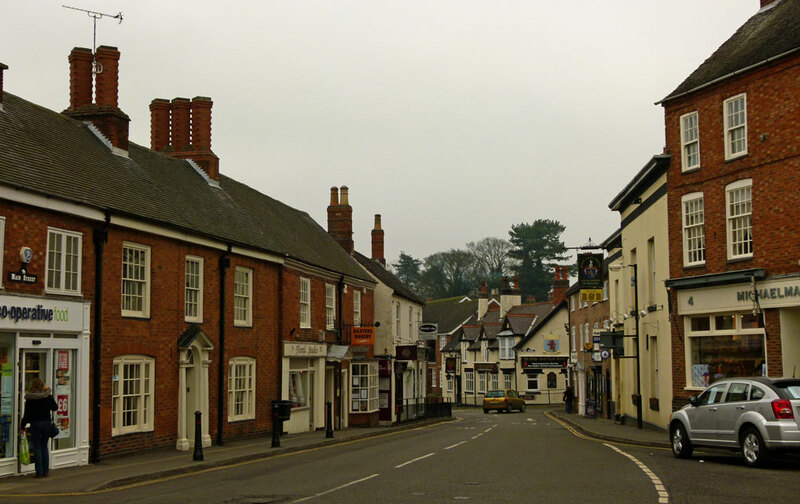 Many years ago I used to live within a stones throw of Bosworth field, long before the arrival of the visitor centre and compulsory cafe, and loved to go there to imagine the day when Richard fell and the Tudor dynasty was born. Makes me want to go back………. Thank you so much for popping by and leaving a comment, Marilyn! That’s nothing – you should see what today’s politicians get up to – slightly less bloodshed, though! Great post and excellent history lesson. That was a very interesting post, so fascinating that the bones were discovered. Another interesting history lesson. It looks a beautiful town. I remember being fascinated by the story when Richard’s remains were discovered and indulged in a couple of months worth of obsessive reading on the subject. I was hoping to visit the site on a side trip during our holiday last year but didn’t get time. Hopefully next time…..
An excellent account of the battle. I have not been to the site, I will have to add it to my list. Excellent post. I was really pleased when Richard’s body was found – it answered so many questions. This is my favorite time in history. I think I have all the David Starkey and Alison Weir books. Thank you for sharing your version of it. Our biggest threat now is the muslim invasions. Have a blessed day. Stay safe out there. I wonder what Richard would have thought of the finding of his remains, and of what felt to me like a rehabilitation of him in terms of his place. You’re kidding! Now is the winter of our discount tent? haha Did you make that up? Interesting and informative post, thank you. “A ‘good’ or ‘bad’ king – concepts which need to be judged in the context of medieval Britain… “. So very true. Not judged through politically correct 21st century eyes. Very interesting read, Mike. I’ll never remember all this, unfortunately. I’ve read accounts of your kings and queens and historical events before, of course, and about 2/3 of the way through everything seems to start receding from my grasp in an ever- thickening fog. But I keep trying. At least I’m planting more and more receptors on which to hang future information. Greetings to Mrs. B. Fascinating! I remember when they discovered his bones, it was a remarkable story. I think I did a post on it. Anyway, wish I could visit this area.